Dancearts accepts students for full semester enrollments. Classes are closed when a maximum number is reached. All classes are subject to change due to enrollment. If 5 or less students are enrolled, the class will be subject to cancelation. If Dancearts must move or cancel a class, the student is entitled to a refund. Discounts are given for multiple classes. The first class is full price, with each additional class of equal or lesser value is 10% off. This also applies to second student in the family. $25 Annual Registration Fee is required for each student. Ages 3 to 6 years - Our Preschool classes consist of Creative Movement and Kinderdance. Creative Movement is a pre-ballet class, for 3-5 year olds, designed to introduce beginning ballet steps in a fun environment and acclimate the student to the dance room setting. It is a 45 minute class meeting one time a week. Kinderdance is open to students who have successfully completed Creative Movement and have the teachers recommendation, or 6 year olds that are new to Dancearts. It is a one hour class comprised, of half an hour of Tap and half an hour of Ballet, meeting one time a week. 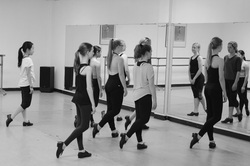 Ages 7 to adult - Performing and non-performing classes are available in levels from beginning to advanced. All classes meet one time per week, except for upper-level ballet classes. Advancement is based on teachers' recommendation. *Some classes have additional requirements that must be met before attending, such as age or ability. Students who miss classes or withdraw before the end of the semester are obligated to pay the full semester fees. In case of prolonged illness or injury, verified by a doctor’s statement, credit may be applied to the following semester. Make up classes are encouraged and must be done during the semester in which the absence occurred.